Long-term contracts have long dominated the international market for LNG. Since 2000, however, the proportion of LNG-traded spot or under short-term contracts has grown substantially, while long-term contracts have become more flexible. While long-term contracts increase the debt capacity of large, long-lived, capital investments by reducing cash flow variability, they also may limit the ability of the contracting parties to take advantage of profitable ephemeral trading opportunities. 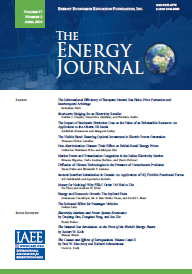 After developing a model that illustrates these trade-offs, we argue that increased LNG market liquidity resulting from a number of exogenous changes is likely to encourage much greater volume and destination flexibility in contracts and increased reliance on short-term and spot market trades. These changes would, in turn, reinforce the initial increase in market liquidity. Proceedings - LNG at the Crossroads: An Auspicious Confluence of Developments?